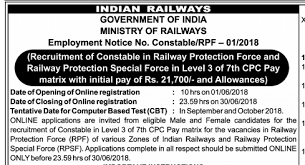 ONLINE applications are invited from eligible Male and Female candidates for the recruitment of Constable in Level 3 of 7th CPC Pay matrix for the vacancies in Railway Protection Force (RPF) of various Zones of Indian Railways and Railway Protection Special Force (RPSF). Applications complete in all respect should be submitted ONLINE ONLY before 23.59 hrs of 30/06/2018 Candidates should ensure that they possess/fulfil all eligibility conditions prescribed for the post as on the closing date for submitting applications. CANDIDATES WAITING FOR RESULTS OF PRESCRIBED EDUCATIONAL QUALIFICATION SHOULD NOT APPLY. The Groups of Zonal Railways and RPSF wise summary of vacancies for Constable is furnished below for immediate reference. Gorkhas, Marathas, Dogras, Kumaonese and other Categories specified byGovt. Choice of Zone/RPSF: Candidate shall opt for a Group and shall further indicate his/her preference of Zonal Railways falling in that Group (except for Group E & F). Candidates opting for Group E and F shall have only the option of N.F.Rly. and RPSF respectively. Once Group is opted candidates will be considered against the vacancies of that particular Group only. Hindi, English, Urdu, Tamil, Telugu, Konkani, Malayalam, Kannada, Marathi, Gujurati, Bengali, Odia, Punjabi, Assamese and Manipuri. Uploading of colour Photograph: Select the Upload Photo tab and upload your recent colour photograph. The photograph should comply with the following requirements. Go to the “ONLINE/E-Application” link. Click on the ‘Modify Application’ link. After making payment, login using registration Number and Password, then proceed with the changes intended as per instructions given and submit the application. Preserve the print out of latest application for record. The following documents in original, as well as their self attested photo copies will be required for verification in respect of candidates who qualify in PET/PMT. Nice post.I wish you luck as you continue to follow that passion. RPF Coaching Center in HyderabadIts very helpful and informative blog.